Aldwyn is a remarkably mellow and thoughtful llama. We both agree that he has an outstanding disposition and a very enjoyable approach to life. There's really nothing to knock in the conformation and biomechanics department, either — Aldwyn has a lot of potential as a capable and companionable personal packer. Our only disappointments are that Aldwyn inherited two non-Classic traits from his mixed heritage: his curaca-type coat, and early puberty with the typically-associated traits of hypersexuality and shorter stature. Either would have meant Aldwyn wouldn't be stud quality for us, and so it was a no-brainer for us to castrate him. 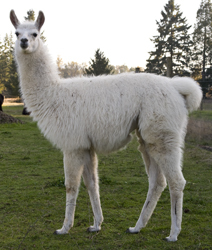 This allows both Aldwyn and us to enjoy his special personality to the fullest, and does no harm to the threatened (and already genetically mixed) Classic llama gene pool. We greatly enjoyed the companionship of Aldwyn's grandsire Cappuccino and great-granddam Lacy, and we also laughed (most of the time!) at the antics and creativity of great-great-granddam Maggie. We see a bit of each of them in Aldwyn. Fortunately, we will be needing another "mentor" gelding to first understudy with and eventually take over from Luka and Shuksan as they age and get tired of keeping rude youngsters in line. Aldwyn is showing excellent potential for maturing into that role, as well as being a strong candidate to become Highlight's "caboose" on the trail (quite the physical feat indeed). As a result, Aldwyn is on track to stay right here — it's one big win-win situation! "Aldwyn" is a very rare Celtic or Saxon name with few historical occurances and a wide variety of meanings, in no small part because the various name elements can be teased out in different ways: "Al" and "dwyn", or "Ald" and "wyn". Whether "old" or "wise" or "from the mountains"; whether "friend" or "shining, brilliant" or "white", they all fit ... and also give Aldwyn plenty of room to grow his own unique personality.